AudioQuest DragonFly Black v1.5 review | What Hi-Fi? Although caterpillars and butterflies are typically used to illustrate the process of metamorphosis, the evolution of AudioQuest’s DragonFly is just as impressive a tale of transformation. Four years ago, the original DragonFly – a DAC and headphone amplifier crammed into the tiny proportions of a USB memory stick – elicited a mixed response of pure delight and ‘whatever next?’ It was conveniently compact, ingeniously simple to use and an undisputed sonic upgrade for our laptops. For this groundbreaking effort, it was named our Product of the Year in 2012. Two years later, its successor the v1.2 (now discontinued), took the gong for its improved sound and since then portable DACs have sprung up faster than daisies in spring. But AudioQuest has figured out how to keep its edge in a cutthroat market, namely by improving compatibility and sound quality, and by dropping the price from £130 to £90. 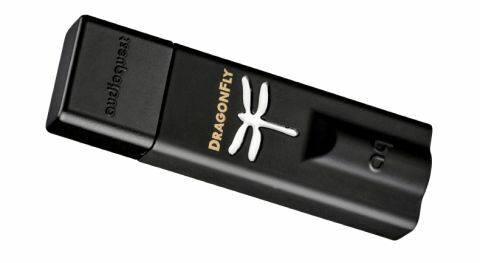 The AudioQuest DragonFly Black (referred to on the back of the device as v1.5) is a more portable version of its predecessors – not in terms of its dimensions, which are exactly the same as its previous ones, but in compatibility. AudioQuest claims the DAC's new Microchip microcontroller draws 77 per cent less current than the Texas Instruments one in the v1.2 – this makes a more appealing case to use it with Apple and Android smartphones and tablets. The older model was particularly power hungry and would drain your battery much quicker. So, if you’ve been craving better quality music on the go, the v1.5 has you covered. You’ll need to purchase a separate adaptor for portable devices, though, which could explain the DragonFly’s more humble price tag. You'll need an On-the-Go cable with a micro USB connector for Android devices (AudioQuest does its own version called DragonTail), while Apple’s camera adapter (£25) should allow the DragonFly to play ball with iPhones. It's worth remembering, though, that not all Android devices allow audio out of their USB connection, so it's definitely worth checking compatibility beforehand. As accessories go, AudioQuest also sells a normal USB extender cable (also, confusingly called DragonTail) in case the the DAC physically blocks any neighbouring USB ports on your laptop. There’s also an improved 32-bit ESS Sabre DAC chip too, and a desktop application through which the DragonFly can receive future software updates. The rest of the v1.2’s genetic make-up is retained: the headphone amp and analogue volume control, and the LEDs that light up in different colours according to file size playback – green for 44.1kHz files, blue for 48kHz, amber for 88.2kHz and magenta for 96kHz. Sadly that’s where it ends, as playback is limited to 96kHz, although it can play higher file sizes (these are first downsampled by your computer). DSD support remains another one for the wish list. A plastic cap slots over the USB end to keep the insides free from the crumbs at the bottom of your bag, and a cute leatherette pouch protects the zinc alloy casing from coins or house keys. The casing’s finish is still a stroke-able soft matte, but AudioQuest has done some colour swapping to distinguish the v1.5 from its predecessor - the DragonFly lettering is now gold instead of white. As we stick both new and old into our MacBook Air, plug in our AKG Y50s (£50) and load up our hi-res music library, it’s clear their sonic differences are just as pronounced. Though clearly cut from the same cloth – the v1.2’s strict balance, rhythmic intelligence and joie de vivre reveals itself in its successor – the Black makes ground on the legacy sound with more insight and dynamic impetus. The new DragonFly Black has a clearer, tighter presentation that makes the v1.2’s seem a little shy in comparison. Taking flight with R.E.M’s Pilgrimage, the AudioQuest delivers plenty of power with the thumping drums, yet is quick enough on its feet to keep them pacing along with the agility intended. It spreads its wings to deliver the space and openness needed to keep the elbows of the reverberating pianos, tuneful guitar lines and dainty chimes firmly tucked in. Stipe’s longing inflections are bold, solid and nicely layered against the echoic backing vocals too. There’s attack to the flamboyant melody, through which guitar chords thrust with more intensity than through the v1.2. In The Last Shadow Puppets’ Bad Habits, strings soar with dynamic finesse just as impressively as when they lurch with exuberance, and the depth to piano keys and insight into the curt, spiky vocals carries the track’s perilous mood to a tee. We stream Band of Horses’ In A Drawer from Spotify and ambient electrics spread evenly about the soundstage, which despite the file’s lower resolution is still ample. Elsewhere, electric guitars twang with texture, the chorus’s allied vocal harmonies are distinct, and it keeps a lid on the treble as cymbals take a battering. The original DragonFly was a groundbreaking product, which rightly won accolades four years ago. The DragonFly Black continues this commitment to better sound quality on a budget, but in an even more impressive package. Like the caterpillar transforming into a butterfly, AudioQuest’s DragonFly line has undergone a similarly remarkable metamorphosis – the outwards appearances may be similar, but this is easily the best DragonFly yet.